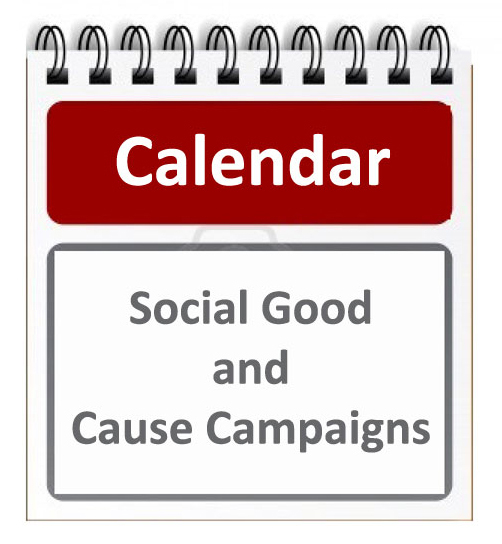 Thus, Nonprofit Tech 2.0 is going to attempt to create a master calendar of annual social good and cause campaigns and I need your help. If you know of such a campaign and would like it listed below, please post a comment on this blog post with the date, name and website URL of the campaign. Please keep in mind that for capacity reasons I can only list events where the URL of the campaign doesn’t change every year or it becomes to cumbersome to manage. Also, if you have a hashtag to recommend for the campaign event, please let me know. * Does not occur on the same day each year. We are holding our 3rd Annual Trees of Hope WI #TreesofHopeWI Festival to benefit the Leukemia-Lymphoma Society, Blood Center of WI and Be The Match (National Marrow Donor Program) on Sat Nov 23rd in Milwaukee WI. Our goal is to raise $50,000 to improve treatments for blood cancers (Leukemia, Lymphoma, Myeloma, etc) and support Bone Marrow Donor Registry. Any help getting awareness of this would be awesome. Sorry. Can’t add regional events. Not adding Months at the moment. Does Feeding America have a page for Hunger Action Day 2013? The Civil War Trust has an annual Park Day to help with hands-on maintenance and preservation at Civil War battlefields and historic sites. Maybe use #CWTParkDay as the keyword? Added National Bike to Work Day… not doing Weeks or Months quite yet. Thanks for this helpful resource! February 14th is V Day – #onebilliionrising http://www.vday.org ending violence against women around the world! September is Childhood Cancer Awareness Month. It is time to make the gold ribbon as well known as the pink. Thanks. Not adding “Months” at the moment, but it is on my To Do List. Hi can you please add World Veterinary Day? It’s the last Saturday of April.